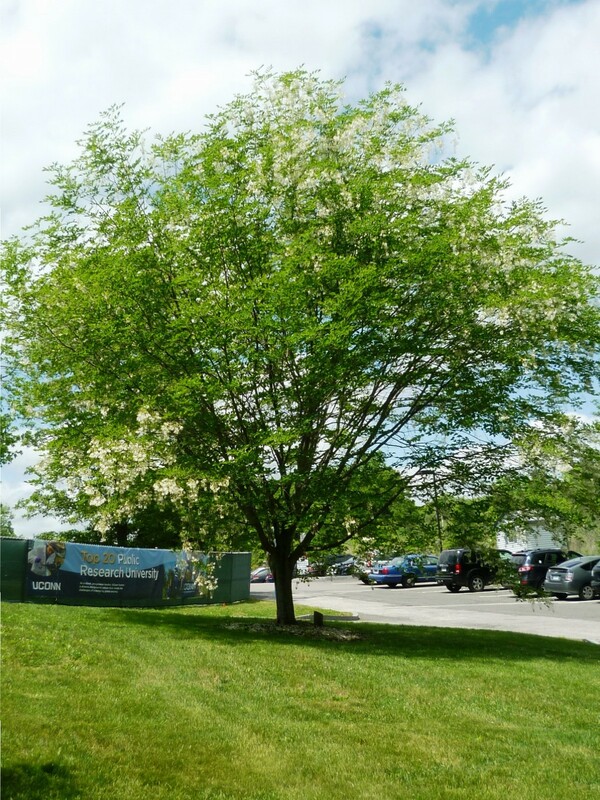 UConn Plant Database photo of young yellowwood tree. Trees with large, showy flowers always attract attention and a closer look. 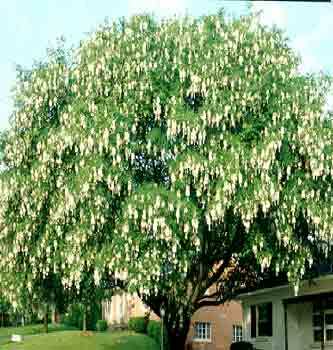 Yellowwood is one such tree not commonly seen here in Connecticut. I am lucky enough to work on the UConn Storrs campus where many more unusual trees are planted and growing well. Behind the W.B. 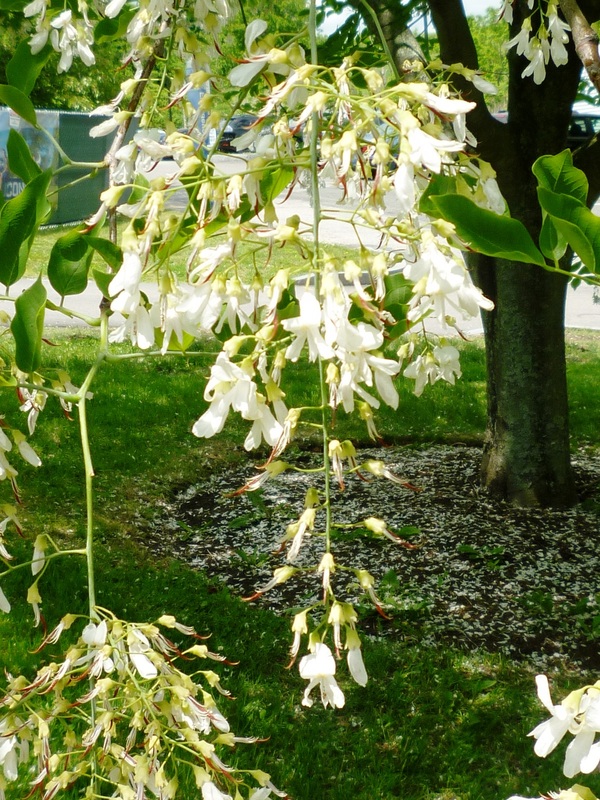 Young Building which houses Plant Science and Landscape Architecture, on the lawn as you exit the south end of the parking lot, is a glorious Yellowwood tree displaying its large, white flowers hanging down like wisteria clusters. As the flowers age, the petals are gently dropped speckling the lawn and mulch white. 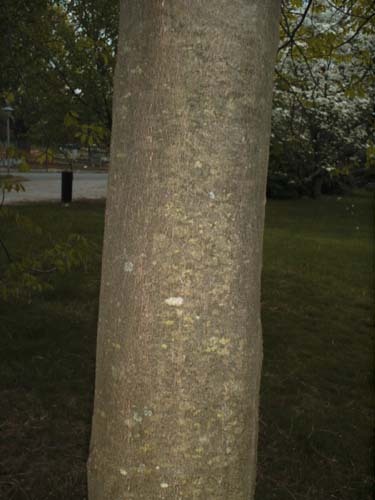 Cladrastis kentukea is the Latin name for Yellowwood, referring to its native range in the south-east portion of the United States, mainly Kentucky, Tennessee and North Carolina. It is hardy here in Connecticut, as the one planted on campus proves. Research shows it is hardy to zone 4. Locate in full sun and well-drained soil to ensure success with this tree. It is also sometimes known as Virgilia. 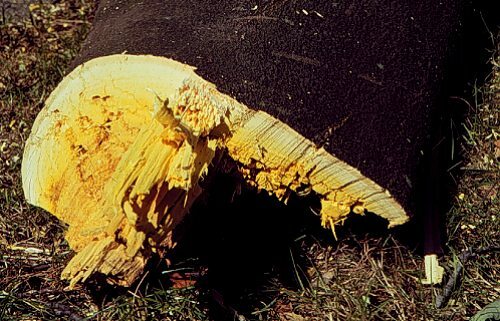 The common name of yellowwood comes from the color of the heartwood of the tree. It has a yellow hued wood used for decorative wood working and gun stocks. The color can be extracted from the root to be used as a dye. 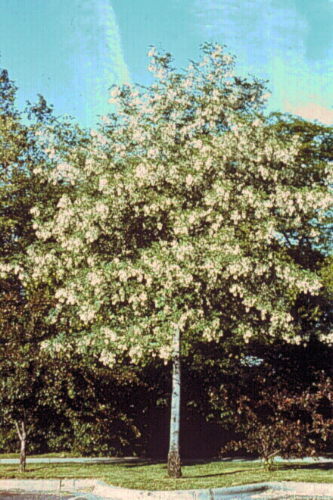 Yellowwood is a medium-sized tree with a uniform, rounded shape suitable for use as a specimen planting or a lawn tree. It makes a great focal point providing great shape, a flowering period and superb interesting branch shape, and interesting bark. The bark is starts out with soft yellow/green twigs, which change to a reddish-brown and finally to a smooth grey to brown at maturity, It has a habit of setting horizontal branches below six feet adding to the structural interest of the tree when it is leafless. 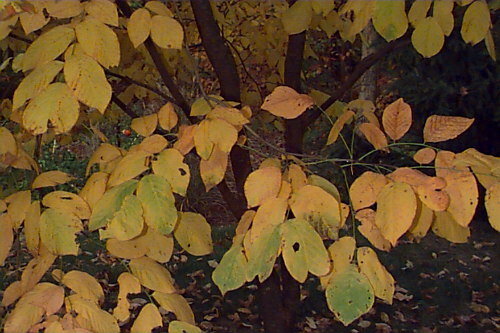 The leaves turn from green to clear yellow, orange and gold during the fall.